Sponsored speaker events remain an effective component of pharmaceutical marketing, particularly in building awareness around a new drug launch or clinical data release. While industry standards point toward an average fee of ~$1,750, we’ve found a considerable range amongst specialty areas. Using the MDDetails platform, we analyzed over 200,000 paid speaker fees in 2014 and have summarized findings below. Note: The red hashes indicate median spend per speaker, whereas the vertical bars represent the range between 25th and 75th percentiles. The underlying dynamics at play here are multi-factorial, however it is clear that intensely competitive markets with a concentrated prescriber base (e.g., oncology, urology, gastroenterology) tend to skew toward the higher end of the spectrum. 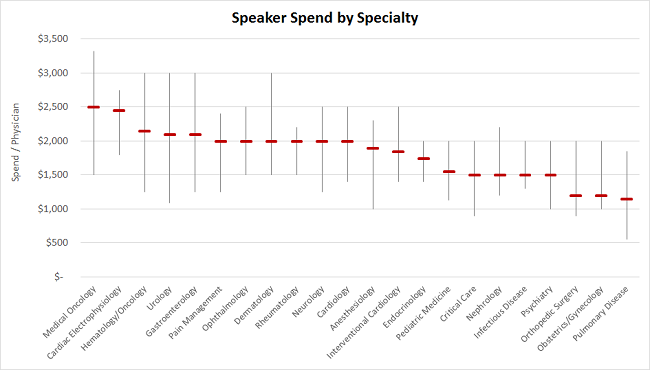 How we can help: In addition to identifying and characterizing potential speakers within a therapeutic area of interest, MDDetails can provide an informed perspective around fees and overall event budgeting.